1. Republic is a membership-based pressure group calling for an elected head of state and an end to any political role—or state funding—for the royal family. We propose keeping our current parliamentary system but replacing the monarch with a directly elected, largely ceremonial head of state. Our campaign is supported by over 29,000 republicans from across the political spectrum, including 15 Members of Parliament. 2. The notion that the law should apply equally to all citizens is a key republican principle which has driven our interest in challenging tax exemptions and reliefs enjoyed by members of the royal household and the Duchies. 3. Our research made the connection between the issue of the Duchy’s tax status and findings of the Information Rights Tribunal which contradicted the Duchy’s previous claims of exemption. This research was the basis of renewed media interest in the issue in December 2012. 4. Republic has long campaigned on issues relating to the Duchy of Cornwall, building up considerable knowledge and expertise in this area. In December 2012 we reported the Duchy to the avoidance unit at HM Revenue and Customs tax-avoidance and wrote to the chair of the PAC, asking her to investigate its tax status. 5. Republic’s view—supported by the evidence below—is quite simple: the Duchy is a legal entity in its own right, separate from the person of the Duke, which operates as a commercial enterprise. There is no good moral or legal reason why the Duchy of Cornwall should not pay Corporation Tax in the same way as any other commercial body generating profits from property and other investments. 7. It is not for us to prove that the Duchy of Cornwall should pay Corporation Tax in the ordinary way, rather it is for the Duchy of Cornwall to provide a clear and convincing explanation of why it is not paying tax in the normal way which it has so far failed to do. The Duchy is not a body or other legal person. The Duchy is not a company and therefore need not pay Corporation Tax. The Duchy of Cornwall has Crown Immunity from Taxation. The Duke of Cornwall has a “peculiar title” to the Duchy and therefore the Duchy need not pay Corporation Tax. It would be unfair for the Duchy to pay Corporation Tax as it would mean that the same income was taxed twice. 9. This document explains why none of these claims should be accepted as a valid reason for not paying Corporation Tax. In truth, there is no good moral or legal reason why the Duchy of Cornwall should not pay Corporation Tax in the same way as any other corporate body generating profits from property and other investments. (j)The Health and Safety Executive (HSE) issued an improvement notice against the Duchy of Cornwall under Section 21 of the Health and Safety at Work etc. Act 1974. The notice was not challenged either by the Duchy or by the Duke. If the Duchy was not a legal person in its own right the HSE would have had no power to issue the notice against it. “Only companies pay Corporation Tax;” (Source: Tax page on Duchy of Cornwall website) This claim is linked to the claim that the Duchy is not a body which is considered in paragraphs 10–12 above. 16. It has been shown in paragraphs 10–12 above that the Duchy is a body in its own right and therefore it is subject to Corporation Tax. It is unclear which “other large organisations” the Duchy would like to be compared to. 18. It is true that partners in partnerships (as defined by the Partnerships Act 1890) are subject to Income Tax as oppose to the partnership paying Corporation Tax. 21. Members of limited liability partnerships (as defined by the Limited Liability Partnerships Act 2000) are subject to income tax and the LLP itself is not subject to Corporation Tax. 22. The Duchy of Cornwall is clearly not an LLP because if it were it would have to be registered as such at Companies House. It should also be noted that just as with partners in a partnership, members of LLPs have to pay Class 2 and Class 4 National Insurance Contributions and Capital Gains Tax on assets of the LLP. 23. The Duchy of Cornwall is clearly not a trust because it is a separate legal person in its own right. Trusts are required to pay capital gains tax and trust income is subject to income tax. (sources: Introduction to trusts and Capital Gains Tax and Tax on different kinds of trust income, HMRC website). If the Duchy believes it should be taxed as a trust then logically it ought to pay Income Tax and Capital Gains Tax which it does not. 26. This opinion is now almost 100 years old and has not been updated to take account of a large number of legislative changes that have occurred in the intervening years including the introduction of Corporation Tax which was introduced in the Finance Act 1965. 29. If Crown Immunity from Taxation does not apply to public bodies then the Duchy of Cornwall which claims to be a “private estate” cannot reasonably claim that Crown Immunity from Taxation extends to the Duchy. 34. It should be noted that the Government Law Officers Opinion from 1913 states that “Taxation is not exacted from land; it is exacted from subjects who are taxpayers.” The Law Officers Opinion does not refer to the tax payable by corporate bodies because it pre-dated the existence of Corporation Tax which was introduced by the Finance Act 1965. 35. 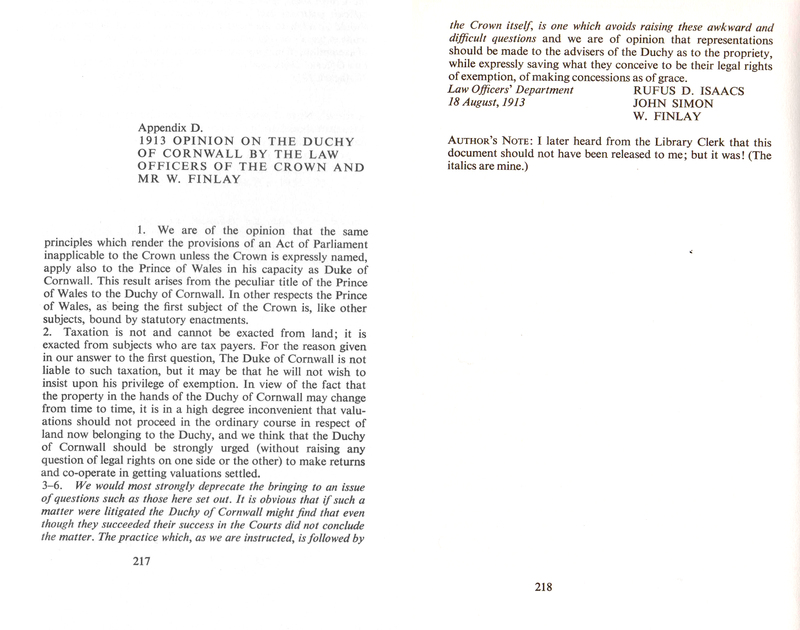 Even if it could be established that Crown Immunity applied to Duchy land this would not affect the tax position of the Duchy of Cornwall or the Duke of Cornwall. The Duchy’s income is not just derived from the land it owns, in the year to 31 March 2012 the Duchy received £4.7m from investments including cash deposits, equity securities and private equity funds. 37. It would wholly inappropriate for the Duchy to claim to enjoy Crown Immunity and not to follow the relevant Government policy applicable to Crown bodies. 38. The phrase “peculiar title” is sometimes used in explaining the Duchy of Cornwall’s special tax status. This is however just another way of attempting to extend Crown Immunity to the Duchy of Cornwall which has been shown to be flawed in paragraphs 24–37 above. In any case, the ownership of a body is not a relevant consideration when determining whether or not it is subject to Corporation Tax. 39. It should also be noted that officials have found themselves unable to explain what the peculiar title is. For example, a Treasury witness giving evidence in 1971 said: “What the peculiar title is, I am afraid I cannot say.” (source: TheyWorkForYou Willie Hamilton MP in 1982 quoting Mr. Strudwick, Treasury witness giving evidence on 6 July 1971). 41. The normal tax position is that a company is taxed on its profits and each shareholder is taxed on the dividend income that he/she receives from the company. It is entirely fair for Prince Charles and the entities he owns to be taxed in the same way as other for other taxpayers and the entities they own. In any case, the fact that a taxpayer (individual or corporate) considers a particular tax to be unfair does not mean they are not liable to pay the tax in question. 42. There is no credible support for the Duchy’s claim not to be subject to Corporation Tax and therefore the Duchy of Cornwall should pay Corporation Tax in the normal way. 43. The Committee should advise HMRC to collect Corporation Tax from the Duchy in the normal way. The Prince of Wales and the Duchy of Cornwall should be subject to the same tax rules as other private individuals and corporations respectively. The arrangement whereby the Prince pays income tax voluntarily and the Duchy’s profits are exempt from Corporation Tax is morally and legally untenable. 44. The Chancellor of the Exchequer should publish a revised Memorandum of Understanding on Royal Taxation stating that neither the Duchy nor the Duke should rely on any claim of Crown Immunity in order to avoid paying tax in the normal way. This advice should apply to tax in respect of prior periods as well as future periods and should extend to any penalties or interest payable in relation to the administration of taxes. 45. The Government should publish its current policy with regards to Crown Immunity and in particular clarify whether it remains Government policy that Crown bodies “are expected to behave as if they were bound by regulations”. 46. If however despite the substantial evidence provided HMRC remains in any doubt as to whether the Duchy is subject to Corporation Tax then HMRC should ensure the question is put before a Tax Tribunal as it ought to with any questionable claim made by a taxpayer in order to avoid tax. 47. The State Aid Branch of the Department for Business, Innovation & Skills should investigate whether HMRC’s failure to collect Corporation Tax from the Duchy amounts to illegal state aid. 48. It is Republic’s view that ultimately the stewardship of the Duchy should be transferred to the Crown Estate or a separate board of fully accountable commissioners, with its net surplus passing directly to the Treasury for the benefit of all taxpayers.